What happens when you hit send to send an email? How is the email sent to the recipient? For a desktop based client like outlook,windows live mail etc then the diagram below shows the overall process of how email is sent and received. The email is composed on the email client (C1). 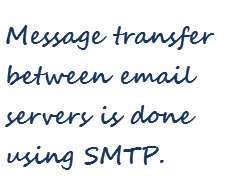 When you hit send the email is transferred to the Email server (S1) using the SMTP protocol. The email server (S1) belongs to your email provider e.g.Yahoo. The email server (S1) needs to deliver the email to the destination server (S2). The destination server (S2) holds the recipients mailbox. It can Deliver the email directly to the destination server S2. It can send the Email to an Intermediate server S3. Direct Delivery – If the sever S2 uses direct delivery then it needs to find the email server responsible for the recipient mailbox. This it does using a DNS lookup and MX records. See Understanding MX records for details. Indirect Delivery – If it chooses to use an intermediate server (S3) known as an email forwarder then the intermediate server must then choose either a direct delivery, or it can also forward to another server. The sent email will eventually be placed in a mailbox on server S2. The server S2 is the email server of the email provider for the recipient. The recipient isn’t notified that her has email. To find out if he has new email the recipient must connect to the email server S2 and check his mailbox. All desktop based email clients will have a default email check interval when they check for new email, as well as a manual option. 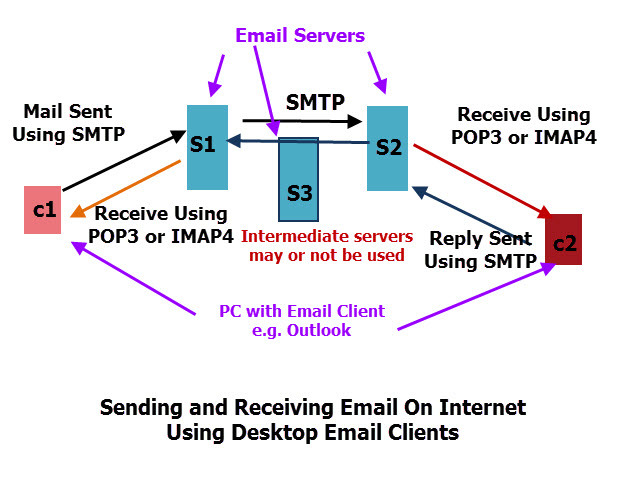 There are two protocols used for transferring email from an email server to a client they are POP3 and IMAP4. Note : SMTP is not used for receiving email on an email client. POP3 is the oldest protocol, and was at one time the only option. IMAP4 is the newer, and much better protocol, and is the preferred option today. The main difference between the two is that POP3 was designed to move the email from the email server to the email client and delete it from the email server. 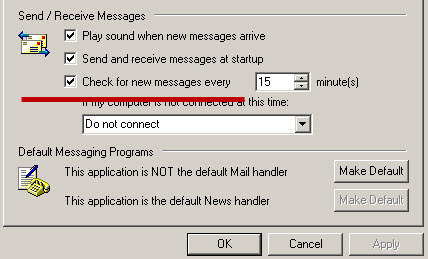 This means that once a POP3 client has connected to the email server it leaves the mailbox on the server empty. and the only copy of the email is now on the email client. IMAP4 was designed to leave all email on the email server and only copy the emails to the email client. 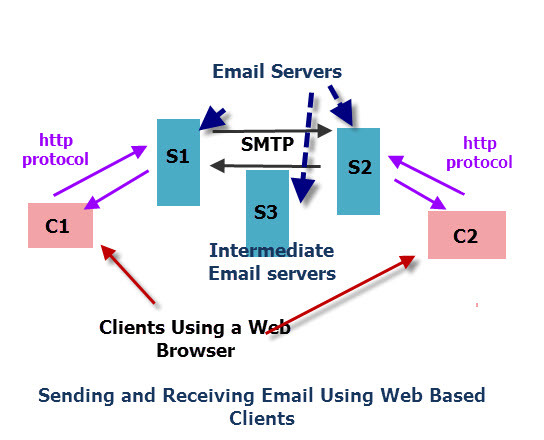 See Understanding Email protocols SMTP, POP3, IMAP4 for more details. A Webmail client is simply a web browser. When the sender hits send then the email transfer to email server S2,and follows the same process as described above. The email is received and stored on server S2 in the recipient’s mailbox. The recipient connects to server S2 using the http protocol to read and reply to any emails. L POP3 and or IMAP4 are not used in this access method. 3. The recipient isn’t notified when they have new email.He must check himself. 4. You could use a POP3/IMAP4 email client to send the email and http to receive the email of vice versa. You can consider a smart phone or tablet as a small PC. A PC can use a desktop based client like outlook express or a web browser for Webmail. A smart phone can also use a web browser and webmail, but because of the small screen size this is not the preferred method. Instead most prefer to use an Email App. Email Apps are just email clients for smart phones and tablets and work just like email clients on PCs. Because smart phones/tablets have very little storage IMAP4 is the preferred protocol. Yahoo, Google and Microsoft provide Apps for their email service. These Apps use http. The email servers shown in the diagrams above are used for storing and transporting email. The email servers that you connect your email client or web browser to (S1 and S2) are provided by your email provider e.g. Yahoo for Yahoo mail. Email servers have different capabilities and restrictions. Some provide access using multiple protocols like POP3 and IMAP4. Some provide webmail access using http, and some don’t. There are also servers that will restrict your mailbox size, number of recipients, attachment size etc. When configuring email clients you will need to know the names of these servers, and what ports they use for the protocols (POP3,IMAP4,SMTP) . Generally you will have no control over these servers. This video below covers the Email Send and Receive process as discussed above. No Images in email– Most clients block images by default,and give you the option to download them. You can turn it on by default in the settings. Attachment Missing– Most clients block attachments like .exe files and other executable file types. Get the sender to zip the file or rename the attachment (you can always rename it back). No Message– This can be a spam filter on the email server blocking the message. Message doesn’t display correctly– You may be set to read messages in text format and the message is sent in html format. Message gets rejected by email server– Bad email address in the to, cc or bcc fields.